Where does Fordyce spots appear? What causes Fordyce spots on lips? Sebaceous glands are parts of the skin similar to the sweat gland. A sebaceous gland is situated in the deeper layer of skin called DERMIS and they produce a chalky white oily paste like substance called SEBUM. 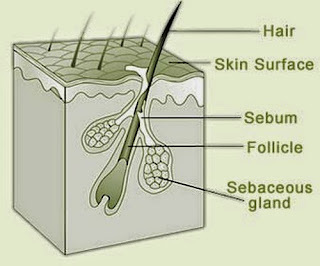 Normally, a sebaceous gland opens into a hair follicle and releases the sebum into it. When the sebaceous gland lies in abnormal sites like the lip where there are no hair follicles it does not have an outlet to release the sebum. This causes building up of sebum inside the gland, making it to appear prominent. Hence they are called as SEBACEOUS PROMINENCE and this causes the Fordyce spot on lip. Fordyce spot on the lip appear as a small elevation of size 1 – 3 mm. It is pale, white or red and looks like a miniature peanut. Does Fordyce spot go away? YES. In most cases, Fordyce spot in lip resolve spontaneously within couple of weeks. As it is a natural condition without any underlying disease, the chances are more for it to disappear automatically if it is left untouched without pinching or squeezing its content out. As said above, Fordyce spot is nothing to be worried about. Skin specialists advice against treatment to Fordyce spot because it does not cause any discomfort while some of the treatment options have undesirable side effects and some may form permanent scars. But most people approach a dermatologist for Fordyce spot only for cosmetic reasons. So, how to get rid of Fordyce spot? Wait and watch: A Fordyce spot disappear or shrink in a small span of time. So wait and watch for couple of weeks. Vitamins: vitamins like B complex regulate the sebum secretion and reduce the prominence of the gland. Adding garlic to the diet can resolve the spots. The reason behind this is not known, probably because of the minerals like selenium in it and chemicals like allicin. Carbon dioxide laser: A laser is a cutting method that uses laser beam to vaporize the unwanted tissues. This laser is directed to the prominent gland which then destroys the tissue without bleeding. It causes complete cure to Fordyce spot and it doesn’t reappear. Sometimes it may cause minimal scarring. The epithelialisation of the spot occurs within 2 weeks time. The success of co2 laser technique has higher success rate when it is combined with topical application of tricloracetic acid. Pulse dye laser: In this technique the laser beam is directed as short repeated pulses. This is more expensive but causes lesser scarring. It is also a permanent cure for Fordyce spot. Other techniques to remove Fordyce spot are Micro puncture, Electro desiccation, Photodynamic therapy and chemical cauterization. So, if you are doubtful of having Fordyce spot and want to get it treated, check with your dermatologist and weigh your treatment options as some techniques work better than others due to individual variability.